Leading Manufacturer of bamboo shape beeswax candle and pure beeswax from New Delhi. 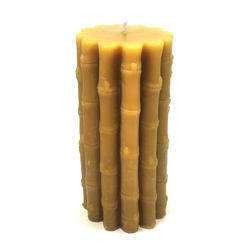 Bamboo Shape Beeswax Candle are the cleanest, brightest and long burning candles. They are eco-friendly in the sense that they burn without any chemically hazardous emissions. 100% pure Beeswax does not require any chemical processing. It is one of the densest waxes and has a high melting point, it means that Beeswax does not need any hardeners, additives, or chemical treatments to make a quality product. Beeswax candles emit light that is similar to the light spectrum of sunlight. This is thanks to beeswax's high melting point of approximately 149 Degree Fahrenheit. 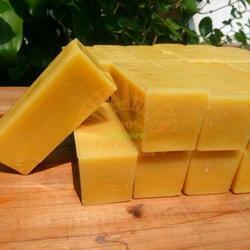 Because beeswax has a higher melting point than other waxes, it emits the brightest, most warm-toned flame. Beeswax candles also last longer than most other candles. Because it is so dense (0.958), it burns slower and drips less, and many consider beeswax candles to be drip free. Pure Beeswax has a subtle and natural scent, so it does not need any additional artificial or other fragrances. We are the supplier of 100% Pure Beeswax.